Distributed antenna system (DAS) is a sequence of radio heads well positioned around a targeted place for the purpose of fulfilling the requirement of additional cellular coverage. Each of the radio heads within the distributed antenna system is then routed to a communication center through fiber-optic cable to permit the cell signal to be managed by a cellular base station. In other words, distributed antenna system is a system of spatially distributed antennas associated to a common source that supplies wireless services within a particular geographic region. Also, DAS systems can handle multiple bands for multiple operators at the same time. The global distributed antenna system market is anticipated to expand at a CAGR of 10.8% during the forecast period from 2018 to 2026. The global DAS market was valued at US$ 7.29 Bn in 2017. Currently, adoption of distributed antenna systems by end-users is increasing due to several factors such as growing popularity of mobile communication devices and growing demand for wireless connectivity networks across the world. 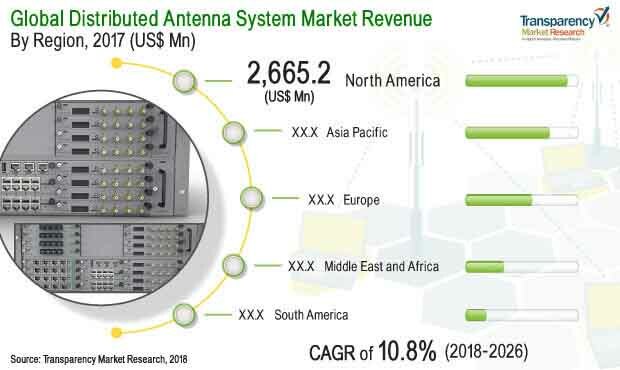 At present, the distributed antenna system market is expanding at a higher rate due to increasing government focus toward enhancing the telecom infrastructure to support on-going connectivity. The distributed antenna system market is mainly driven by growing requirements to boost communication signals across the world. In addition, increase in higher bandwidth applications and in-building demand is also contributing to the growth of the distributed antenna system market around the globe. Public safety communication mandates are anticipated to supplement the large-scale adoption of distributed antenna systems over the forecast period. Apart from this, multiple end-use industries are adopting distributed antenna systems in order to provide enhanced and uninterrupted internet connectivity across the world. All these factors are expected to drive the distributed antenna system market during the forecast period. However, high initial cost of distributed antenna systems and upgrade issues are the major concerns restraining the market growth. This is primarily due to the high cost of implementation and high labor cost associated with the installation of the distributed antenna system. However, growing demand for DAS network solutions for larger venues, and growing awareness and adoption of distributed antenna systems across emerging economies such as the Asia Pacific, Latin America, and Middle East & Africa is anticipated to offer lucrative opportunities in long-term. The distributed antenna system market is segmented on the basis of component, technology, and application. By component, the market is categorized into hardware and services. Among these components, hardware is further segmented into active DAS, passive DAS, cabling and hybrid. The market for active distributed antenna systems is further cross-segmented into head-end and remotes, trays, antennas and others. The passive distributed antenna system market is sub-categorized into donor antennas, trays, repeaters and others. The market for cabling segment is further sub-categorized into coaxial, optical fiber, CAT5 and others. Similarly, the market for hybrid DAS is further divided into head-end, and remotes and repeaters. Furthermore, services segment is categorized into design & installation services and maintenance services. Based on technology, the global distributed antenna system market is categorized into cellular/commercial and public safety. Public safety distributed antenna systems are projected to see healthy growth during the forecast period. On the basis of application, the distributed antenna system market is segmented into offices/corporate campus, hospitality, health care, education, transportation, government, industrial, stadiums and arenas, and others. Among these, hospitality, government, and stadiums & arenas are the key applications supplementing the growth of the distributed antenna system market. The rising penetration of distributed antenna systems has encouraged many regional and global companies to extend their product portfolio across the world. Among these companies, some of the major players in the global distributed antenna system market are American Tower Corporation, AT&T, Inc., Bird Technologies, Cobham Wireless, CommScope, Corning Incorporated, Dali Wireless, SOLiD, Boingo, and Tessco.